The August 2012 issue of Esquire had some excellent content... with one feature in the brilliant writing category and then three additional pieces that stood out as interesting. The brilliant writing category piece was "The Lethal Presidency of Barack Obama" by Tom Junod and it's, well... brilliant. I can't say that I'm in any way outraged by the drone killing strategy, but it is a fascinating and important topic that Junod lays out for the reader exceptionally well and with an interesting approach. The pieces that didn't necessarily reach the same level of prose (which isn't disparaging at all), but still covered some interesting topics were by Chris Jones, Ken Kurson and Peter Martin. Jones did a celebrity profile of Jeremy Renner and "Each Time Slightly Bigger, Slightly Braver" provided a different than expected view of the action star as a home flipper extraordinaire. Two short and just plain interesting (yet again, that word) pieces from this issue were "But, Soft! What Light Through Yonder Window Breaks?" with Kurson's expectation of a post-election stock market rise come November (regardless of who wins) and "The TV That Lets You See Everything" by Martin on the OLED follow-up to High Definition TVs. Esquire an excellent magazine and lots of good stuff in this recent issue. Very profound cover story in the latest issue of Time Magazine that brought to mind other pieces from Time on the same subject. The recent feature by Nancy Gibbs & Mark Thompson was titled "The War On Suicide?" 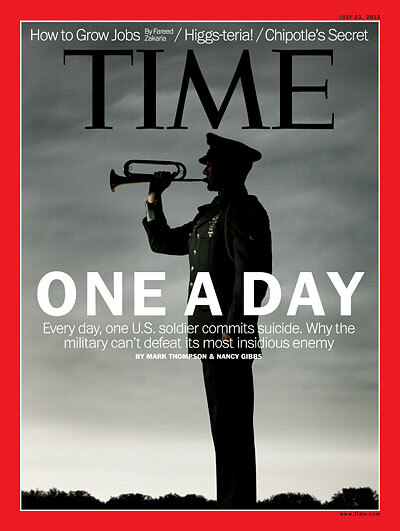 and details the epidemic of suicides among current and former U.S. military personnel. 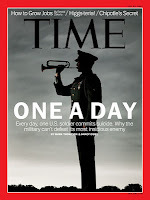 The authors cite current statistics of one active duty suicide a day and one every 80 minutes among all veterans, but go beyond the horrifying numbers to detail the personal stories of several recent suicides by active duty servicemen. Just painful reading the depiction from a surviving spouse of mental health help that was sought in vain within the military. Along these lines, the piece very much brought to mind some past Time features I've noted and linked to by the same writers. Mark Thompson penned in April 2009 "Why Are Army Recruiters Killing Themselves?" and in December of the same year I did this blog post on the Nancy Gibbs Time cover story "Terrified or Terrorist?" about Fort Hood shooter Nadal Hasan. Both works very much shared with the recent cover story a commonality of showing an active duty military culture of pushing forward and not showing weakness or a need for help. On the same subject, but with actually a positive take-away was the December 2010 piece "Bringing Dogs to Heal: Care for Veterans with PTSD" by Mark Thompson and then in November 2011, I wrote a blog post featuring another Thompson Time cover story "The Other 1%" about the all too frequent disconnect between non military personnel and those who serve or have served. It's an extremely difficult problem with no easy solution, but Gibbs and Thompson have done excellent work shedding light on the situation and need for greater efforts by the military at helping it's own. There was some really solid writing on remarkable people in the latest "Where Are They Now?" issue of Sports Illustrated. Longest piece was a feature by Gary Smith titled "Why Don't More Athletes Take A Stand?" on a University of Virginia walk-on football player taking part in a hunger strike to protest the low wages of many University service employees. It's the same type of eloquent writing Smith known for and tells the story of Wonman Joseph Williams while addressing some much larger questions about athletes and contribution to a cause. From the "Where Are They Now?" section of the issue came two additional pieces of note... both well written and one on an interesting subject, the other on a truly remarkable one. In the interesting subject category was the Lee Jenkins piece "Life's Roses (and Sausages)" on former University of Texas and Houston Oilers running back Earl Campbell. The former Heisman Trophy winner has certainly been through a lot and it's pretty compelling reading on him. The other piece from this edition of SI that stood out was "The Strength To Carry On" by David Epstein. Just an amazing piece on Nazi death camp survivor Ben Helfgott. After liberation from a concentration camp at 15, Helfgott became one of 732 Jewish orphans brought to group homes in England. They became known as The Boys and through their lives have accomplished quite a bit together in terms of philanthropy and sharing their stories of success... with the 1996 Martin Gilbert book The Boys as a record of it. Well written stuff from Epstein in this SI piece and again, an amazing story. There's been a few tremendously interesting pieces of writing from Time Magazine lately to note here. Cover story from the most recent issue was "Roberts Rules: What the Health Care Decision Means for the Country" by the always solid David Von Drehle. About the deciding vote cast and rationale behind it from Supreme Court Chief Justice John Roberts, it's informative writing on what seems to be an extremely measured decision. Two feature pieces from the past month or two that also stood out as well written pieces on interesting topics were about business efforts from Elon Musk and Howard Schultz respectively. Jeffrey Kluger wrote "Rocket Man" on the founder of Tesla Motors and SpaceX who has had big months at each company he leads and Bill Saporito provided "Starbucks' Big Mug" on efforts to both grow the business and aid the economy overall. Interesting writing in each piece on big steps taken by both company leaders. 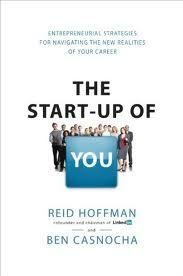 Following on the heels of recent good books with career guidance I've seen, LinkedIn founder Reid Hoffman co-wrote with Ben Casnocha The Startup of You. It's a solid read with quite a bit around people being solely responsible for their career... regardless of whether they're entrepreneurs or an employee. To the idea behind the chapter title, point is made in the book that the business strategies of successful startup companies often mirror strategies employed by successful people in a career. Hoffman and Casnocha write about how one's career strategy should be a combination of (A) their assets, (B) aspirations and (C) market realities. Additionally, they cover the importance of someone developing a competitive career advantage (and being able to describe it)... with it oftentimes best to have that advantage or focus area as narrow as possible (an idea I've seen written about previously). An idea put forth in the book is people should start to do the things they find interesting and see where it goes, but do so within a framework. To this point, Hoffman & Casnocha describe "ABZ planning"... with A as what someone is doing now, B what they pivot to, and Z their fallback career option. Its also noted that this Z planning can mean the worst case scenario to a career move often isn't that terrible (another idea I've previously noted others writing on). Casnocha and of course Hoffman believe in the idea of LinkedIn as a facilitation tool towards a larger principle of network building and usage... with a focus on genuine networks built around helping rather than simply a focus on what can be gained from a relationship. They note that this network strengthening can come from simply putting oneself out there through regular sharing on social networks. In terms of benefit that might eventually result from this network building and helping others, the authors note how its often not first, but second or third level connections (as shown on LinkedIn) that get people jobs. Two ideas out of this chapter are to look for networks of interesting people and to budget time for personal improvement... or network/relationship development. Interesting concept from this chapter was around developing a strategy of small risk taking to help prevent big risks from occurring or feeling so large... i.e. small fires prevent the large burn. Last chapter before the Conclusion contains the idea that it's the management of information that really counts (with LinkedIn Signal as a tool to use). Additionally noted is the value of being a go to person in a particular area... which brings to mind the aforementioned idea of going narrow in focus / competitive advantage development. Overall it was an excellent read and the website Startup of You has an additional resources section which includes an executive summary of the book as well as PDF of LinkedIn usage tips. 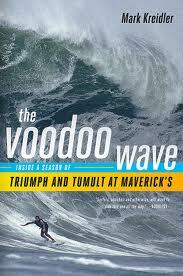 Written by ESPN writer and San Francisco area radio host Mark Kreidler, The Voodoo Wave was an entertaining book on Maverick's in all its forms... an extreme surf spot off the coast of Half Moon Bay, CA, collection of elite surfers who ride its waves and business venture. Big wave surfing as a subject was very much in line with one of my favorite books from 2010, The Wave by Susan Casey, and while I thought the writing from Casey perhaps a bit more lyrical, Kreidler seems to have put in solid journalist legwork and provides a very interesting read. The content about the surfing and surfers themselves was pretty riveting and included depictions of Maverick's surfing godfather Jeff Clark who first rode and then made known its waves, Grant Washburn and Chris Bertish. The business end of Maverick's was perhaps equally interesting with the tale of Keir Beadling, CEO of Mavericks Surf Ventures, and his efforts to create a profitable consumer brand out of the intended to be annual big wave surf contest. While certainly not as inspiring as the surfers themselves, Beadling comes across in the book as a somewhat sympathetic character with his efforts to make a business while working with the dualities provided by the other people involved. As a direct partner with Beadling, there was Jeff Clark himself... who seemed a solid guy, but who wanted to both get paid and run things completely his way. To this end, Kreidler mentions Clark feeling a bit snubbed by the money and accolades accorded some involved in the excellent surfing documentary movie Riding Giants that he was heavily featured in. Additionally, there was the talent provided by the surfers actually competing in the contest, many of whom didn't mind the idea of making a living at it, but were focused on the love of big wave surfing and not necessarily winning (or even competing in if too corporate and not enjoyable) a big wave contest one day a year. Definitely fascinating topics that Kreidler did a good job of covering both wide and narrow and quoted a few times in the book as someone else that's covered and published about Maverick's was San Francisco Chronicle writer Bruce Jenkins. As I was posting earlier today on writing taken from Atlanta Magazine, The Daily Beast and FlipCollective, it occurred to me how many different places feature great writing. With links provided via Twitter, stories from across the web are so much more accessible than in the past and I'm finding great work on sites such as TVFury and Noble Failures as well as those from freelance sports writer Brandon Sneed and Tampa Bay Times writer Michael Kruse. To this concept of great writing I never would have found without Twitter, two brilliant pieces lately were from D Magazine and The Telegraph. From the Dallas-area magazine came "The Most Amazing Bowling Story Ever" by Michael Mooney. It's a remarkable look at recreational bowler Bill Fong and his efforts to bowl only the 22nd verified 900 series with back to back to back 300 games. The Telegraph piece is an obituary with the synopsis "Count Robert de La Rochefoucauld, who has died aged 88, escaped from Occupied France to join the Special Operations Executive (SOE); parachuted back on sabotage missions, he twice faced execution, only to escape on both occasions, once dressed as a Nazi guard." Yep, the rest of the piece is... like that. There's been several pieces of Businessweek writing that stood out lately with the largest a feature by Ashlee Vance on the Pleasanton, CA based company Workday. Titled "The Two Horsemen of the Enterprise Software Apocalypse" it's a detailed look at the fast growing company (and noted Oracle competitor) in the internal business and employee management software space. Also from Vance recently was "Why Microsoft's Surface Tablet Shames the PC Industry" on the latest hardware entry from the technology giant and "Enterprise Technology: Revenge of the Nerdiest Nerds" on data center software company MemSQL. Final BW piece from the last few weeks to note was the interesting "Why Nuance Is Giving It Away" by Olga Kharif. Nuance is a company I'd heard of years ago and they're now perhaps best known for providing the voice recognition software used in Siri by Apple. There's been a few different cases of excellent writing I've seen lately that all fit into the profound / important category. Most recent was an e-mail from CNN Journalist Anderson Cooper that he allowed to be posted online. From Andrew Sullivan's news site The Daily Beast, Anderson Cooper: "The Fact Is, I'm Gay" features a very well written note from Cooper that concludes with "I still consider myself a reserved person and I hope this doesn’t mean an end to a small amount of personal space. But I do think visibility is important, more important than preserving my reporter’s shield of privacy." On the Fatherhood topic I love to read and post on, a few days ago I came across the piece "Daddy Blues" by Tony Rehagen for Atlanta Magazine. It was very cool writing on something that can be both incredibly rewarding and difficult to deal with. Finally, a very short piece with heft to it was "Toiling in Obscurity" for the site FlipCollective. Tom Dinard writes in it of a stopping a large display case from falling on a toddler. It's an emotional piece that's made all the more interesting with nobody noticing the lifesaving act made.